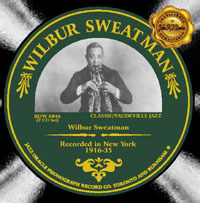 A compilation of pioneering recordings made by African-American clarinetist Wilbur Sweatman, a veteran of the vaudeville stage who made an important contribution to the popularization of jazz music in the late Teens and early Twenties. This set was compiled by Mark Berresford, an authority on Sweatman, and includes extensive liner notes written by Mark based on his research into Sweatman’s life and music. Wilbur Sweatman, cl; acc. by (1) Unknown t; tb; Nathan Glantz, c-mel; vn; Malvin Franklin, p; bb; James Lent, d. (2) Nathan Glantz, c-mel; unknown vn; Malvin Franklin, p.
New York City, c. December 1916. Wilbur Sweatman, cl, ldr; Vess Williams, Clarence ‘Piccolo’ Jones, as; Henry Minton, ts; Charlie Thorpes, bar; Frank Withers, bsx. New York City, April 1917. New York City, April-May 1917. William ‘Crickett’ Smith, t; Arthur Reeves or Major Jackson, tb; Wilbur Sweatman, cl, ldr; Dan Parrish, p; Ogese T. McKay or Jerome ‘Romy’ Jones, bb; Henry Bowser, d.
New York City, Thursday 28 March 1918. William ‘Crickett’ Smith, t; Arthur Reeves or Major Jackson, tb; Wilbur Sweatman, cl, ldr; Dan Parrish or Palmer Jones, p; Henry Bowser, d.
New York City, c. late March – early April 1918. William Hicks, t; Arthur Reeves, tb; Wilbur Sweatman, cl, ldr; Dan Parrish, Palmer Jones, p; Henry Bowser, d.
New York, Tuesday 28 May 1918. William Hicks, t; Major Jackson, tb; Wilbur Sweatman, cl, ldr; Dan Parrish, p; Henry Bowser, d.
New York, Friday 14 June 1918. William Hicks, t; Major Jackson, tb; Wilbur Sweatman, cl, ldr; Dan Parrish, p; unknown, d.
New York City, Tuesday 25 June 1918. William Hicks, t; Major Jackson, tb; Wilbur Sweatman, cl, ldr; Dan Parrish, p; Jerome ‘Romy’ Jones or Ogese T. McKay, bb; Zeno Lawrence, d.
New York City, Friday 16 August 1918. Unknown t; Major Jackson, tb; Wilbur Sweatman, cl, ldr; Dan Parrish, p; Jerome ‘Romy’ Jones, bb; Zeno Lawrence, d.
New York City, Wednesday 21 August 1918. William Hicks, t; Major Jackson, tb; Wilbur Sweatman, cl, ldr; Dan Parrish, p; Jerome ‘Romy’ Jones, bb; Zeno Lawrence, d.
New York City, Friday 4 October 1918. William ‘Crickett’ Smith, t; Major Jackson, tb; Wilbur Sweatman, cl, ldr; Dan Parrish, p; Henry Bowser, d.
New York City, Wednesday 4 December 1918. Arthur Briggs, t; John Reeves or Frank Withers, tb; Wilbur Sweatman, cl, ldr, unknown, possibly Mazie Mullins, Cm; Dan Parrish, p; Henry Bowser, d.
New York City, Friday 17 January 1919. New York City, Wednesday 5 February 1919. Arthur Briggs, t; John Reeves or Frank Withers, tb; Wilbur Sweatman, cl, ldr; George Smith vn; Dan Parrish,p; unknown, d.
New York City, Saturday 8 February 1919. Arthur Briggs, t; John Reeves or Frank Withers, tb; Wilbur Sweatman, cl, ldr; Dan Parrish, p; unknown, d.
New New York City, c. 8 February 1919. William Hicks, t; John Reeves or Frank Withers, tb; Wilbur Sweatman, cl, ldr, Unknown, possibly Mazie Mullins, ts; Dan Parrish, p; unknown d (same drummer as 5 Feb. 1919). New York City, Saturday 22 March 1919. William Hicks, t; John Reeves or Frank Withers, tb; Wilbur Sweatman, cl, ldr; Dan Parrish, p; Jerome ‘Romy’ Jones, bb; unknown d (as 22 Mar. 1919). New York City, c. mid-late March 1919. William Hicks, t; John Reeves, tb; Wilbur Sweatman, cl, ldr, Dan Parrish, p; Walter Gray, bj; Arnold Ford, Arthur Shaw, Arthur Gray, banjolines; unknown d (same as previous session). Someone shouts at the end of 78373. New York City, Saturday 29 March 1919. Russell Smith, t; John Reeves, tb; Wilbur Sweatman, cl, ldr; Bobby Lee, p; Jerome ‘Romy’ Jones, bb; Herbert King, d. .
New York City, Wednesday 24 September 1919. Russell Smith or Charlie Gaines, t; Calvin Jones, tb; Wilbur Sweatman, cl, ldr; Bobby Lee, p; unknown, bj; Herbert King, d.
Russell Smith or Charlie Gaines, t; Calvin Jones, tb; Wilbur Sweatman, cl, ldr; Bobby Lee, p; Herbert King, d.
Eugene ‘Bud’ Aiken, Leslie (Leonard?) Davis, c; Calvin Jones, tb; Wilbur Sweatman, cl, bcl, ldr; Percy Green, as; Raymond Hernandez, ts; Walter Hall or Duke Ellington, p; Clyde Johnson or Mike Danzi, bj; Jerome ‘Romy’ Jones, bb. 9-11 E. 37th St., New York City, Thursday 18 September 1924. Eugene ‘Bud’ Aiken, Leslie (Leonard?) Davis, c; Calvin Jones, tb; Wilbur Sweatman, cl, bcl, ldr; Percy Green, as; Raymond Hernandez, ts; Walter Hall, p; Harry Batcheldor, bj, v-1; Jerome ‘Romy’ Jones, bb; Maceo White, d, v.
79 Fifth Avenue, New York City, Friday 10 October 1924. Wilbur Sweatman, cl, acc. by Walter Hall, p; Harry Batcheldor, bj. New York City, c. March 1926. Wilbur Sweatman, cl, acc. by Henry Green, tb; Ida Roberts, p; Hazel Vanverlayer -v.
Wilbur Sweatman, cl, acc. by Benton Heath, p; Lester Miller, bj-1, g-2. Russell Smith, t; Calvin Jones, tb; Wilbur Sweatman, cl, ldr; Benton Heath, p; Lester Miller or Eddie Gibbs, g; Ogese T. McKay, bb; Zeno Lawrence, d; Gerald ‘Corky’ Williams, v-1. New York City, Wednesday 27 March 1935.